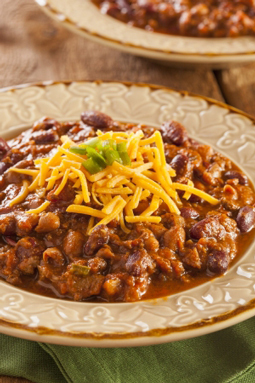 Wild Rice Chili Con Carne - A recipe from Savor California, the online showcase for extraordinary gourmet foods and beverages from California. Steep the dried red chili in hot water for approximately 20 minutes. Heat olive oil in a 7-quart Dutch oven, and sauté onions and garlic. Add meat and cook on high until meat losses color. Sprinkle with paprika, cumin, oregano, chili powder and salt. Cook for 5 minutes. Add tomatoes, cook for 1 minute, bring to a boil, then simmer for 15 minutes. Add beef broth, steeped chili, beans, and wild rice, and simmer for 1 ½ hours.